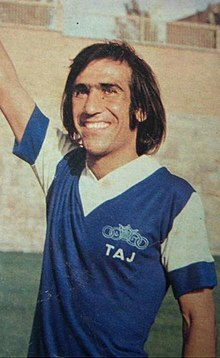 Ali Jabbari is a retired Iranian football Midfielder who played for Iran in the 1972 Summer Olympics . He also played for Taj SC. On 13 May 1972 during a group match at the 1972 AFC Asian Cup, Iran were trailing 0-2 vs Thailand. Ali Jabbari turned the match around with a hat-trick in the space of 8 minutes, with goals in 80', 86' and 88', giving Iran first place in the group. He scored again in the final which Iran won vs. South Korea. ^ "Ali Jabbari". National Football Teams. Benjamin Strack-Zimmerman. Evans, Hilary; Gjerde, Arild; Heijmans, Jeroen; Mallon, Bill. "Ali Jabbari". Olympics at Sports-Reference.com. Sports Reference LLC.